The governor of the State of Washington has announced a moratorium on the death penalty in his state, citing concerns about fairness in the administration of capital punishment. 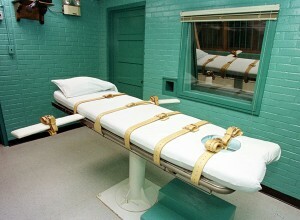 He says that a moratorium will allow the people of Washington to join the debate about the death penalty. Here in Texas, the next opportunity to enact a moratorium on the death penalty will be in the Texas legislative session begins in January 2015, when Texas will have a new governor for the first time in almost fifteen years. Washington Gov. Jay Inslee on Tuesday announced a moratorium on the death penalty in the state, saying capital punishment was being used inconsistently and unequally. The Democrat said his decision came after months of research on current cases and discussions with prosecutors, law enforcement officials and family members of homicide victims. He also said he toured death row and the execution chambers at Walla Walla State Penitentiary. The moratorium does not commute the sentences of those on death row or issue any pardons, but Inslee will grant reprieves so no one will be executed. Since the state’s current capital punishment laws were put in place in 1981, 32 defendants have been sentenced to die. Of those, 18 had their sentences converted to life in prison. One was set free. The state’s last execution was in September 2010, when Cal Brown died by lethal injection for the 1991 murder of a Seattle-area woman. Nine men are on death row in Walla Walla. Maryland abolished the death penalty in May, the sixth state to do so in seven years. Inslee said he did not question the guilt of the condemned criminals nor the seriousness of their crimes.